Whether you live by yourself, with a spouse or with children, performing domestic chores such as house cleaning, cooking, washing, ironing, taking care of children and grocery shopping can be very tasking. That is why people usually hire maids to help them carry out these domestic services. Employing a full time maid has numerous benefits and although this bit of luxury doesn't come cheaply, it is usually worth the price. A full time maid can be an independent person who works for their own or they belong to an agency. Before you hire a full time maid, here are 10 things that you should know. Before you hire a full time maid, you should be aware of the employment laws. 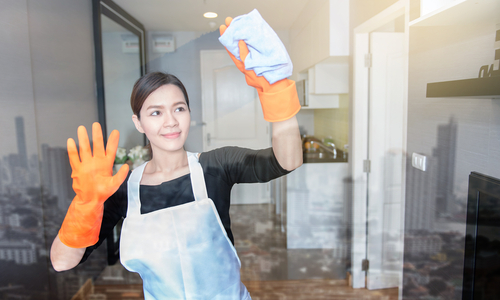 Even if you are using a maid agency or doing it yourself, it is important that you know these laws in order to protect yourself. 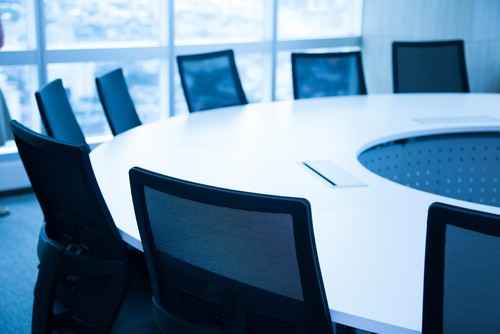 It is mandatory that both employers and employees have a sound and equal understanding of employment law for a safe and fair working environment. Failure to adhere to these laws can be costly to you as an employer and the offence carries expensive fines and even custodial sentence. As an employer, you will have the responsibility of ensuring that the general well-being of your employee is well catered for You should ensure that you are able to provide them with enough food, suitable accommodation and working environment as well being able to pay the salary on time. Before you employ someone for domestic services, you usually have a budget of what you are willing to part with whether weekly or monthly. Unlike a part time maid, a full time maid is available 24/7. Generally, the more experienced the maid is, the more expensive they will be Maids usually charge based on the number of services they are required to deliver. Look for a maid that will fit in your budget and also it is good to have a flat rate charge rather hourly which is expensive. A full time maid is someone you will be staying with in your house and therefore checking their background information and identity is very crucial. This is someone you will be heavily relying on and therefore you need to look for that trust. At one point you will leave them in your house and therefore it is important to employ a genuine individual with a very good background. You can use maid agencies and referrals to perform background checks. Ask for genuine identity card, passport and age. You need to have clear expectations on what the person you are employing is coming to do and won't be doing in your home. You can draft a chore list on what tasks you want to be performed and any other specific instructions that you might have Negotiate with your expected employee on how you expect things to be done before work begins. Ensure that you set boundaries on what you don't expect them to do or where you don't want them to go. Some rooms may be out of bounds for non-family members. If you don't want your helper to use your computer, TV, telephone and other things, stress it out before they begin to work. Service proficiency is one of the major things you should know about a maid before hiring them. Are they able to perform household tasks efficiently and effectively? If you want a house maid to do daily cleaning housework or cooking ensure that they can deliver all these without dragging themselves. Check if she is willing to wash and dry the clothes since some maids aren't willing to work without washing machines. The idea of service proficiency is just to ensure that you are hiring someone who is going to efficiently perform the tasks that they are assigned. Full time maids especially the experienced ones are going to cost you a little more but it's usually worth it The experience matters because you don't want to employ someone who isn't well versed with what she is tasked to perform. You don't want to come home to find some of your kitchen ware broken, the babies aren't properly fed or the house disorganized. Experience becomes important especially if you have kids at home. You only want to hire someone who understands the basics of communication and behavior around your kids. It is necessary for you to know what illness your expected helper has previously suffered from before you hire them. Enquire if they have any long term chronic illness because you don't want to hire someone who isn't medically fit to work or risks exposing you and your family to some transmissible diseases. As an employer, you have a duration in which you are seeking to hire someone. Have a commitment time line for you and your expected employee. Know that you can have a trial period for a couple of weeks that will let your maid to fully adjust to your work expectations. A trial period will help to protect you and the maid because you can easily terminate them if they don't meet your expectations. A full time house maid is just like any other employee and they are entitled to additional benefits. Besides giving them some days off, they are entitled to salary increment, insurance benefits, vacations, paid sick leaves among other things. Hiring a full time maid usually comes with multiple responsibilities and high expenses though its benefits to your household can be so immense. Hiring them through an agency can sometimes be very complicated but if you put in the time and effort to look for the best helper, there will be mutual benefits between you and your domestic worker. It is important to know which questions you will ask during the interview because you want to hire a person who will help you carry out the domestic chores effectively and efficiently. When you maintain the kitchen area clean, then you will be healthy and cook healthy meals. Be that as it may, when you don't make day by day cleaning in your house then the shot of health problems increments and it will get you vulnerable to unhygienic meals. The first thing that you ought to do is basic, consolidate a portion of the things that you have in your kitchen. For example, stack your dirty dishes, set aside unique elements you have, and ensure that you put everything that you have to clean, set away, and move into one area. By consolidating, you will have the capacity to perceive what you have tocomplete, and after that set up a legitimate plan moving forward. Work on smaller tasks first, and don't attempt to do everything without a moment's delay. 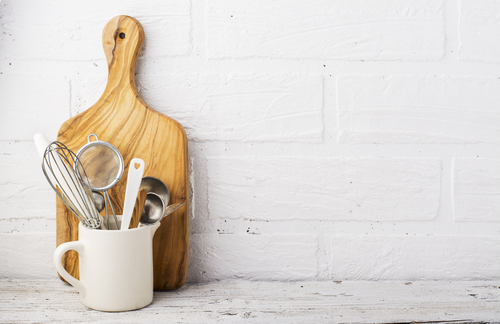 It's too simple to get overwhelmed with trying to clean and clear your kitchen. By working on a couple of small things first, you'll have the capacity to tackle everything that you have to complete relative straightforwardness. Simply don't work on everything without a moment's delay. You can find a way to cleaning your kitchen, and complete things in time. This space is the preferred of bugs, microbes, and furthermore rodents. Bugs and fungi typically are in the vast majority of these spaces to make the area dangerous. That makes it important to clean up the storage bins on a consistent basis and make it clear. At the point when there is any bad aroma by the trash would you be able to guarantee then that you clean it as quickly as could be expected under the circumstances. While cleaning the trash, you may be able to use the right cleaning agent and wash it carefully. This truly is one more adored piece of molds and furthermore fungi. You should examine these types of containers regularly and have them dry. The bread bins must be cleaned carefully before you choose to put the loaf of bread again inside those containers. On the off chance that you find the fungi at the end of the day then the contents should be thrown and the container must be cleaned with some vinegar. After the washing is done at that point, put the bin in the sunlight to permit it to dry completely. Many individuals are probably going to neglect the cutting boards, and these are generally not maintained accurately. The vast majority ordinarily wash them off and store them in the kitchen area. This could turn into an issue if the volume of microbes raises if the machines are not cleaned well. The cutting boards must be cleaned right after their use. You ought to apply an excellent cleaning solution and some high temp water to clean the wooden boards completely. After cleaning the board you should keep the board in a hostile to the septic solution and put it for drying. The plastic material boards could likewise be cleaned in a dish washing machine. 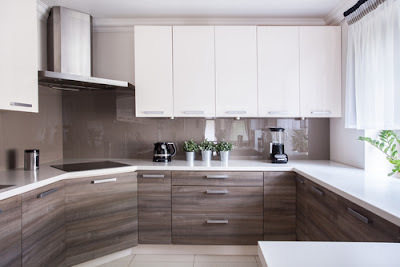 At the point when the home cupboards are not clean then this would decrease the attractiveness of kitchen yet additionally raise the bacteria growth. Many individuals disregard kitchen cupboards in the wake of cooking food and washing the plates. All the garbage found in the cupboards must be taken away, and a solid cleaning agent must be used to clean the boards completely. Dusting you cabinets is included in this category. Take a soft clothing and rub out the dust on your cabinets and you are good to go. What is that sticky, cheap grime that appears to accumulate on your kitchen counter tops and stove top persistently? The grime that develops in this way is essentially cooking oil residue infused with accumulated dust particles. If you live in a polluted or especially dusty area, this can start to occur inside not as much as seven days of your last kitchen cleaning. The solution? A microfiber material wet with boiling water; make certain to use dishwashing gloves so as not to burn your hands. The fabric constantly should be rinsed with boiling water to stay as hot as could be expected under the circumstances and in this way soften the oils develop. towels, put them in the microwave and run the microwave on high for five minutes-the steam will relax the grime. Enable the towels ten minutes to chill off and after that spritz them with a lemon-infused cleanser or dish washing liquid, wiping the grime from the microwave and sterilizing it all the while. 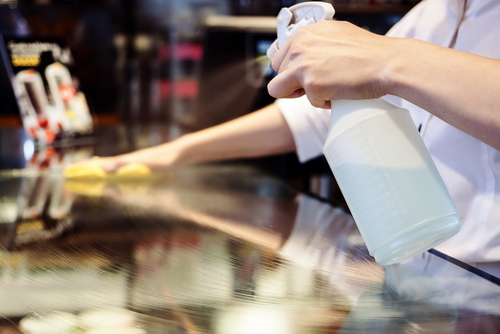 There is a reason why you're dishwashing liquid is infused with the power of lemons-lemon is especially compelling at targeting food-related 'oil and dish grease,' which likewise happens to accumulate in your sink and your drain. A cleaning sponge with a generous splodge of dishwashing liquid [not diluted as is regularly the situation when the dishes are being washed] ought to be successful for scrubbing your sink, yet perhaps not by any stretch of the imagination for cleaning your drain. For optimal drain cleaning, a solution of lemon squeeze and heating pop ought to be poured down your drain and left to do its magic for no less than an hour before running water through the drain. It can be easy for you to get rid of the lingering kitchen odors, regardless of whether it be a slightly pungent trash bin or a particularly strong-smelling supper that you recently cooked. All you need is to dilute a significant portion of some vinegar in a liter of water and heat up the solution on the stove for about thirty minutes, let it settle for some hours, and afterward bubble it again for 30 minutes. The vinegar may not smell especially great while cooking, but rather it will clear the quality of residual odors that may linger for seven days. 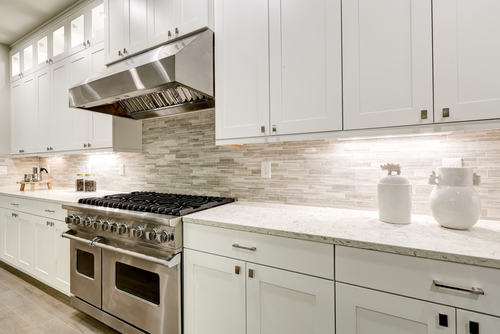 The smartest thing that you can do about cleaning up your kitchen is just to clean a little at a time. The more you endeavor to shove into a limited capacity to focus time, the harder it will be to advance. Cleaning a little at a time will help you learn a couple of smarter techniques, as well as keep from getting overwhelmed by the need to clean and clear things up. One of the most common chores at home is cleaning. Cleaning is an essential part of daily home maintenance. Cleaning is essential to every household in order to keep away harmful microorganisms that might cause diseases. For many people, cleaning can be an arduous and undesirable task. This is especially true if you are doing your cleaning the wrong way. 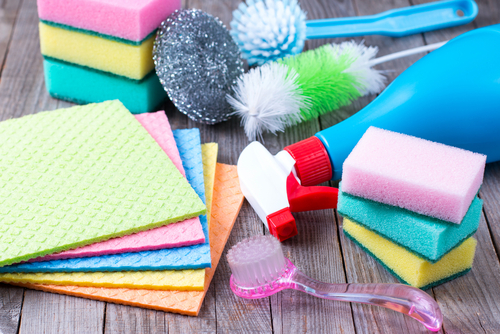 Nowadays, you can find a lot of cleaning materials and accessories in Singapore. But if you don’t have the right cleaning tips and routine maintenance tips, the cleaning accessories cannot be of any use to you. So what are the best practices and home cleaning tips for high-quality house cleaning? Let’s look at some of them below. The first thing that you need to do is to carefully identify and separate the different sections of the house based on their cleaning needs. Doing this is critical because you need to carry out your cleaning in an organized and efficient manner. Identifying the different areas helps you determine what kind of equipment and accessories you need to use for the job. The areas that require similar cleaning processes can be grouped into one and cleaned at the same time. 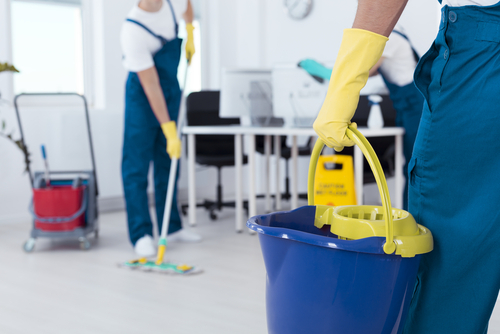 If there are areas that could require more effort to clean, you can reserve sufficient time to clean them when it is appropriate. One of the practices you need to adopt is a cleaning routine that prioritizes efficiency and allocates time based on cleaning requirements. This is important because you need to do a cleaning job that is both energy-efficient and time-saving. When you start cleaning your house from the bedroom, for instance, you are sure that once you are done with that area, there will be sufficient time for the place to restore and have adequate time to dry up without any disruption or disturbances. 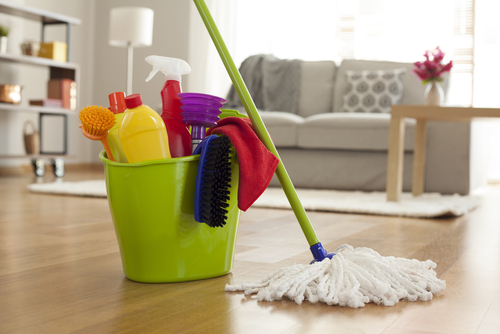 Cleaning the living space last also gives you more time to focus on a thorough and comprehensive cleaning process. There are many different cleaning accessories for house cleaning. 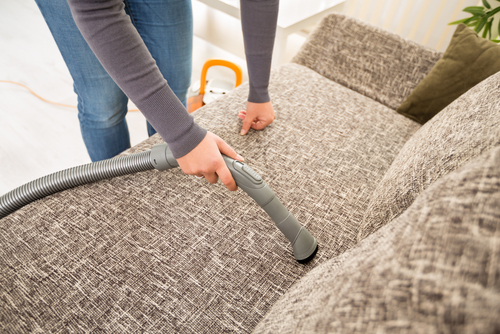 You can find brooms, vacuum cleaners, dust clothes and many other accessories for cleaning. Each of these accessories has their different applications. You need to use every equipment the right way if you want to have an effective cleaning process. Mops, for instance, are the best for the floor whether you are doing wet or dry mopping. If you are just doing a routine sweeping, on the other hand, make sure that you are using the right broom. You can use a hand broom for quick sweeping of smaller areas and long brooms for comprehensive sweeping of the whole house. Cleaning home environments is a clearly defined process for the most part. Despite that fact, there are particular times when some improvisation is needed in order to achieve the perfect job. The truth about every different home is that each house is arranged and designed differently. For this reason, some cleaning routines may not work best for every single home out there. For homes that have complicated interior designs, for instance, a more detailed approach is needed to achieve a good cleaning job. That is why you can opt to improvise and use cleaning substances like alcohol and vinegar to remove some kinds of stains where detergents are not able to do the job. Things like dusters, brooms, and mops are only effective when they are in proper condition. A worn out mop not only does a shoddy job but it also forces you to use too much energy when carrying out a cleaning routine. In general, you need to dispose of any cleaning equipment that cannot handle a cleaning job without leaving traces of dirt. Continuing to use a nearly obsolete accessory can only achieve the opposite of want you want. Cracks and crevices in the house are the main inlets for dirt and other contaminants. When your house has too many openings, it can be a great challenge to control the amount of dust and dirt getting into the house. The best solution in this situation would be to seal off the unnecessary openings in the house. 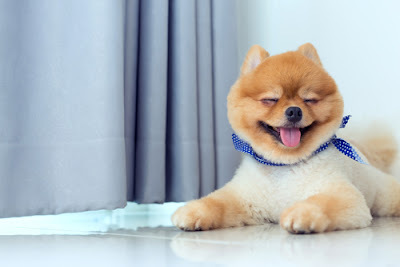 You can also look for more effective coverings like curtains and window blinds in order to control the dirt getting in. You should be mindful of how you go about the sealing exercise, however, because you do not want to block the important inlets of clean air. Accessories like mats and rugs and very important when you want to control the amount of dirt getting into the house. These accessories are the best for maintaining a clean house because they help to reduce the frequency of cleaning routines. Mats kept at the door, for instance, are the best for trapping small dirt particles from shoes. Instead of focusing too much on the amount of time you spend on cleaning, you can choose to monitor the effectiveness of your mat over a period of time. Doing this is important when you want to keep your house clean for longer duration. While it is impossible to entirely get rid of dirt and impurities at home, it is not impossible to clean your house in a more efficient and lasting manner. You have the ability to apply creative practices in your home cleaning routine in order to achieve desirable results. 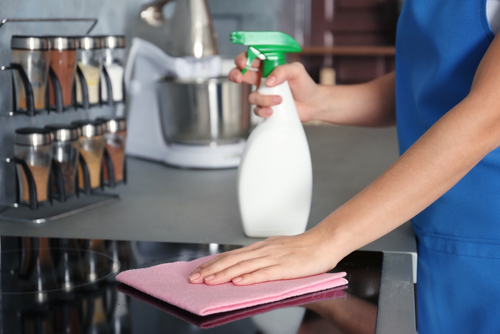 Cleaning home environments is not something that needs to take up too much of your time. With the above home cleaning tips, you can achieve an effective home cleaning job and use your extra time doing other productive things in your life. Singapore is a very crowded city, with a population of over 5.5 million. Considering that most of its inhabitants are professionals, it can be really hard for them to manage the house chores, along with their job. However, house-related tasks shouldn't be neglected, and if you have the right guidance, you will be able to do it in the shortest time. The following article will focus on a very important aspect, which is cleaning the toilet. Toilet cleaning is often neglected by many people, due to lack of time. Still, once you have all the necessarily information, you will realize that this task isn't so complicated, and you can follow this list to do, in just a few minutes. When you're cleaning the toilet, the water will splash everywhere and all the nearby objects tend to wet. Also, you will need plenty of space for cleaning the exterior part of the bowl, and you don't need any items to interfere with the job. Make sure that you put them nearby, because otherwise, you might forget to put them back when you finish. The top tank must be cleared of objects as well, because you don't want to drop anything in the bowl, while cleaning it. This is a very simple rule but most people seem to forget it or simply neglect it. Before you add the solution, you will need to flush. This way, all the impurities will be removed and you will be having a moist surface, perfect for any cleaning formula. There are many solutions available on the market, which come in gel, liquid or powder form. It's only up to you, which one you choose. Add the solution with care, and try to aim for the edges of the bowl. This way, the cleanser will cover the whole surface, and won't touch the water in the toilet. If you want better results, let the solution soak for at least ten minutes. Now that you've applied the cleanser and it's soaking, you should focus on the exterior bowl. For that, you shouldn't use the same cleanser that you've been using for the interior. Instead, you should have a modern surface formula or even a window formula. They are both effective and will make the toilet bowl shinny and clean. While you're cleaning the exterior of the bowl, it's advisable to start from the top. This way, the solution will cover the whole bowl and it will allow you to finish the job faster. So start spraying and rubbing the whole surface with a rag or a napkin. Focus on the edges, as they tend to get dirtier. Once you've finished the rubbing and the bowl looks clean, get a dry rag and wipe the remaining impurities. This is another important aspect, when toilet cleaning. 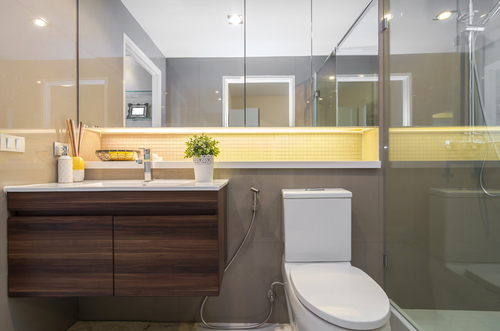 You have to focus on the toilet seat because, even if it looks clean, it might have plenty of bacteria that need to be removed. 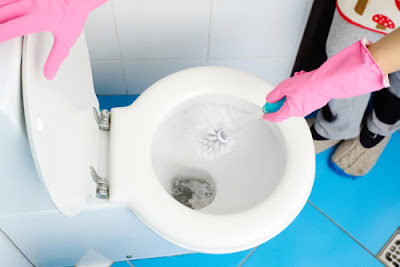 The best method to clean the toilet seat is with an antibacterial cleanser. In order to start, you will have to lift the seat, and thoroughly spray it on the inside. Let it soak for a few seconds and then rub it, until the whole surface tends to dry. After that, you should lower the seat and repeat the same process on its exterior surface. Many toilets in Singapore come with detachable seats, so if you have one as well, you should take it off for a bit. This way, you will clean it better and you'll have a bigger maneuver space. Once the ten minutes have passed, you can proceed to cleaning the interior of the bowl. Be aware that the toilet cleansers are highly dangerous for human skin, so you should wear a pair of cleaning gloves, or any kind of glasses that you have around you. For this procedure, you will also need a soft brush or a sponge. Don't rub the toilet with abrasive items, because they tend to damage the ceramics. Proceed with scrubbing the bowl from the top, in clockwise moves. Scrub under the rim as well, because that's also a friendly place for bacteria. After you finish cleaning the rim and the superior part of the bowl, focus on the bottom part. Follow the same procedure and scrub, using clockwise moves. After you finish cleaning the interior of the toilet, put the lid down and flush. The top tank is also extremely important, even if it's distinct from the toilet. Considering that most top tanks in Singapore are white, they tend to look dirty as soon as they gather a little dust. That's why, it's better to use an antistatic solution, to avoid this problem in the future. Start spraying the tank's surface, and rub it gently with a soft napkin. It's important to be as delicate as possible, because if the tank is made of plastic, you might scratch it or break it. After the whole surface is clean and shinny, you should rub it again with a dry napkin. Now that you've finished the toilet cleaning, you will have to make it absolutely perfect. Even if you properly clean your toilet, there are some stains that will remain, and you will have to remove them as well. The best way to do it, is with a dry rag or a napkin. Try to look at the toilet and identify any stains of marks. Rub them gently, until you get a nice and shinny surface. After you do that, your toilet should be as good as new. Toilet cleaning is considered by many, a very complicated task. However, once you have a full list to do and you know how to act, the whole job won't take you more than a few minutes. After you finish, you will be surprised by the results and you will be happy to make your toilet shine again. Singapore is one of the most developed cities in the world, and thousands of people are moving in here, every year. Most of the people who move in a new house are professionals, and it's a bit hard for them to keep their living place clean. Lack of time is usually the biggest excuse and many of them motivate that they can't sacrifice their little free time for that. However, if you do it in a smart way, you can take care of the house related tasks and have plenty of free time as well. The following article aims to provide some useful tips, on how to keep your house clean and tidy, without spending too much time in the process. Most people are usually doing the laundry on the weekends. This isn't a bad approach but if you're doing it only once a week, you will have a huge pile of clothes to deal with. This will cost you time and will make you sacrifice some of your favorite activities. Instead, if you do the laundry every two days, you won't even feel the effort. Put your laundry in the washing machine in the morning, before going to work. When you return, you will find them clean, and ready for drying. This process won't take you more than a few minutes and it will soon become a routine for you. Sometimes, your house needs a more intensive cleaning, and you will feel overwhelmed by how much work you have to do. Most of the times, this will discourage you, and you will probably postpone the whole thing for another day. However, if you prioritize all the tasks and take them step by step, you will find it easier to start. Set yourself some small goals and try to stick to them. If you plan to do a general cleaning, don't expect to do it all in the same day. Divide your chores and spend one day, for each of them. You will soon be excited to see that your progress works out and you'll have an extra incentive to do it. This may sound like a silly tip, but it's the golden rule when it comes to keeping your house clean and tidy. This should be your top priority after you wake up, because it shouldn't take you more than two minutes. After you make the bed, you will see that the entire room looks more organized and tidy. This will make you more positive and optimistic, for the rest of the day. Also, you will feel more motivated to continue cleaning the rest of the room, when you return from work. Nobody likes dust. It ruins the aesthetics of the house and it can also lead to some health disorders, if inhaled for a long time. That's why, it's essential to clean your 'dust collecting' objects as soon as you can. Normally, the dust is gathering on the flat surfaces but it's important to clean even the tall furniture, where you can't really notice it. If you spend at least half an hour per week with cleaning the dust, you will have a clean house and the dust won't gather as fast. For better results, it's advisable to use anti-static dust free solution. House cleaning should be a group activity and if you don't live alone, you should take advantage of that. If you have children, you should assign them some small tasks too, like taking out the garbage or cleaning their rooms. This will make them more responsible and it will make things a lot easier for you. When it comes to house cleaning, every little help can make a difference, and you should ask for it, whenever you need it. You're just watching TV and the commercials started? Great! Now, you have at least 15 minutes, that can be used in a productive manner. Even if you use the commercials time to do the dishes, put the laundry in the basket or even vacuuming your living room, it will make a significant difference on the long run. A lot of things can be done in 15 minutes and if you use that time effectively, you will have less work to do for the following day. If you do that, it doesn't mean that you're a cleaning freak. It means that you're a responsible person, who likes to keep its house clean and tidy. Besides other cleaning tips, this one mostly applies to the kitchen chores. If you just cooked and the stove got dirty, take a napkin and clean it on sight. After you finish eating, do your dishes as you go. The leftovers on the plates tend to harden, and you will spend more time if you decide to do this later. Being an organized person, who likes to keep its house clean is great. But still, you shouldn't overdo it. Try to understand which are the tasks that need immediate attention, and which are the ones that can wait. For example, it's not necessarily to clean your furniture or to vacuum the floors every single day. But it's necessarily to do the dishes, clean any kitchen or bathroom spot and take out the garbage. 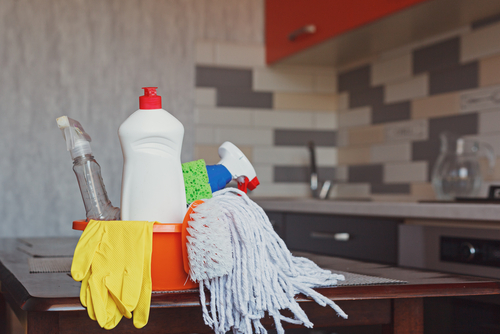 Try to prioritize the tasks and include them in a certain time pattern, according to our cleaning tips. This way, you won't lose sight of the important tasks and you won't spend time for things that can wait. Keeping your house clean and tidy is a very fun activity, if you're organized. Our cleaning tips should help you keep your house in a shinning condition, so you will enjoy living in it. Remember to take it slow, prioritize the important tasks and pay attention to every detail. If you do this, you will have a perfect living environment like you've always wanted, and you will see that house cleaning is actually entertaining. Whether it is our home or workplace there is no denying the fact we need to take some special effort to keep them in good condition. 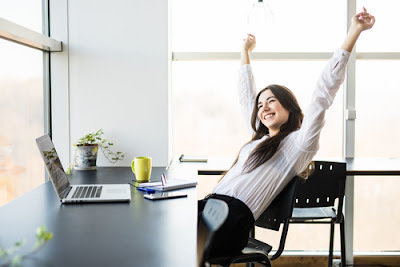 However, given the fact that most of us are busy and are short on time, it is only obvious that we often slip when it as far as proper cleaning house or office habits are concerned. This leads to our home and office becoming dirty. So, what is the way forward? We need to hire the services of professional house cleaning service providers. They are becoming quite popular because of some obvious reasons. However, opinions are quite divided as far as hiring of these professionals is concerned. Hence it would be worthwhile to find out the various advantages and benefits of hiring these professionals. We are sure that the next few lines will give a reasonably good perspective about the various advantages which one can get by hiring these professionals. One of the biggest advantages of hiring professional house cleaning services is that you can be sure about the quality of cleaning that you will get from them. Since they come with the right experience and expertise you can be sure that they will go all out to keep the home totally clean at all points of time. They use the best of techniques and methods to make this possible and we are sure that it will not be possible on our part to do the same. They know where exactly to look for dirt and debris. The will leave no stone unturned to clean the entire home including all nooks and corners. Another important reason why it makes sense to choose these professionals is that the can clean the home exactly in the timings which suit you. 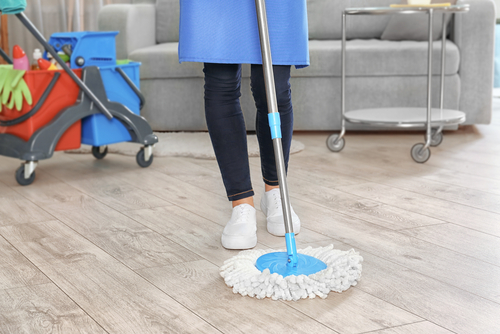 You could choose either weekdays or weekends and they will take your convenience and comfort into account before actually getting into the act of cleaning of your home. You must also be aware of the other clean home benefits which you can expect from these professionals. You can expect 100% home based services when you hire these professionals. Of course they need to be at your home to clean it but they also take care of cleaning various fixtures, fittings and other movable items in your home without taking it to their factory or workshop. An unclean home without any doubt is the breeding ground for various pests and microorganisms. Hence you must give it the importance it deserves. Even if you delay cleaning the home for a few days, you could have quite a few pests infesting the homes. Once they take firm root, you can be sure that you will have a tough time exterminating them. Hence you must now show any carelessness on this aspect and make sure that you appoint a good professional house cleaning service provider. They know what it takes to keep the home and surroundings clean. Once this has been ensured, you can be sure that the home and also the surrounding areas will be free from any types of pests. We may not realize that a major cause of various breathing ailments, skin allergies and other such problems could be attributed to the quality of indoor airs. Hence it is important to keep the indoor air clean and breathable at all points of time. This can be possible only when the insides of our home are clean and free from impurities. While use of modern gadgets including air filters could help, regular cleaning of the home and keeping it free from dirt, grime and other impurities is extremely important. This can become a reality only when all the rooms, the garden, backyard, the garage, attic, store room and other areas are cleaned on a regular basis. This is best done by hiring the services of these professionals. Though you could spend money in hiring these professionals, if you look at it from the right perspective you will no doubt be saving money in the whole bargain. You can keep the quality of the home in good condition. This will ensure that you and your family members are relatively free from diseases caused by unclean surrounding and quality of air. This will in itself help you to save big amount of money and keep the whole family healthy. Given the high cost of medical bills this will translate in smart savings especially over a long period of time. If you spend time and choose the right house cleaning professionals, your house will no doubt look much better, cleaner and neater. The walls will look new and well painted, the flooring will be ever so shiny, and the furniture, fixtures and fittings will also look spick and span and will attract the attention of passerby. A clean and well maintained home will be a pleasing site and it has been found that it could help a lot in increasing the value of your property. This is not a mere statement and there are studies to prove that a clean and neat home, including the garden and backyard could see its value increasing by at least 15 to 20%. If we pay attention to the cleanliness of our homes and appoint professional, you can be sure that the durability and longevity of your home will get increased quite significantly. For example the wooden furniture and fixtures will be free from infestations of microorganisms. The plumbing and electrical work will also last that much longer. The painting, artworks and other such costly investments will also have an extended life. Finally the biggest benefit of hiring these professionals is that you will have the best of infrastructure and facilities available at your doorsteps and this certainly is a great way to keep your home clean, green and perfect from all points of view. Hence at the end of the day there is hardly any doubt that hiring a good house cleaning professional is not a revenue expenditure but an investment for increasing the value of your home. You’ll need the tile and tub cleaner, brush, toilet cleaner, a sponge and rug for cleaning the bathroom floor. Start from the top and move down to the floor. Clean all the mirrors, followed by the countertops, and sinks before cleaning the shower wall as well as the tub. When you finish with the walls, move to the toilet. Clean the bowl as well as the tank cover and proceed to the outside of your toilet. Lastly, clean the floor, starting from the farthest corner as you work your way towards the door. Strip the beds immediately you wake up in the morning. After taking your breakfast put the sheets in the dryer and start the house cleaning process. Straighten up the nightstands and dresses and if you have a ceiling fan, remove dust from it using a feather duster. Next, using a vacuum cleaner, clean the walls and remove any dust bunnies developing on the walls and clean the mirrors before pledging the dressers as well as bed headboards. Finally, vacuum the floor then remove sheets from the dryer and make your bed. This tip alone can help you cut your cleaning time by half; clean each room at a time, ensuring that you start and finish at the same point in each to avoid wasting time moving back and forth. Maintaining consistency will greatly help cut the time down because as you do repeat the procedure every time, you establish a routine. The routine forms the basis of your method thus giving you an inherently better house cleaning way. Speed will then emanate from your method and not from hurrying which implies efficient housecleaning. Start with the highest points such as shelves, table tops and cupboards in your room and move across the room from left to right. This approach ensures you do not miss anything and ensures you don’t unintentionally knock dust onto cleaned lower shelves. After cleaning uppermost areas, clean the top of furniture, all handrails and undersides of shelves, picture frames, and knickknacks. Experts recommend paying particular attention to the top of furniture since that’s where the most dust gather before falling off. Dampen sufficiently with warm water the microfiber you are using so as to get rid of fingerprints. You can only carry out the cleaning task proficiently if each level surface in your home is free of paper, dirty dishes, toys, and other clutter. So, pick such litter and dispose of to pave the way for efficient house cleaning. Avoid the temptation to sweep them to one side of your room, in the hope of finding ample time to discard them off later properly. Also, eliminate any distraction caused by out-of-place items so as to make the cleaning chores a quick and effortless task. While picking the clutter, take the time to second-guess your possessions. The fewer they are, the fewer the items you have to pick up and dust. Put books, magazines, DVD’s, toys and other items you’ve outgrown in a closet. Invest in sturdy, high-quality cleaning tools; replace rickety and outdated Mop with the latest, innovative swabs and invest in efficient cleaning products for simple and practical cleaning. Make sure you have at arm’s length all the necessary cleaning tools and products, so you won’t waste time moving back and forth to pick them from the cabinet positioned under the sink. Also, wear the right gear such as an apron and put the cleaners in small spray bottles which are substantially easy to carry. Try as much as possible to take everything you’ll need with you so as to stay organized thereby saving considerable time. Put few drops of dish soap in a basin of water; wipe it liberally on the window using a cloth before squeegeeing it off. Move from top to bottom, cleaning the blade every time at the bottom, and you’ll get a streak-free clean window. If a squeegee is not available, use a microfiber rug and a glass cleaner. As you wipe with the cloth, use horizontal strokes, moving from the top downwards. 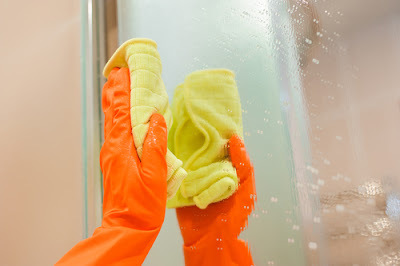 Do not rub the window in circles because if you do so it will leave streaks; you shouldn’t also wipe glass panes with a paper towel since it leaves a residue. House cleaning can be an easy task provided you follow the follow expertly recommended the procedure and use the right cleaning techniques for various areas of your home. So, always use the above, house cleaning strategies and tips whenever you are cleaning your house, and you’ll save considerably not only time but also energy. Picking the clutter before starting ensures you do not get distracted while cleaning. Also, make sure you have all the necessary tools, cleaning detergents and carry enough requirements to ensure you do not waste time moving back and forth as you pick them.